Nine-time CMA Musician of the Year Mac McAnally talks about his Mississippi roots. Mac McAnally waited for me in the parking lot of Spark’s Restaurant, tucked behind the wheel of his dusty black Suburban. The trusted tools of his trade – a pair of steel string Olson and MacPherson acoustic guitars, a gut string and an octave mandolin, a National resonator, and a Peavy electric guitar – were stowed carefully behind him. On this particular Sunday afternoon last June, I could, with a little poetic license, imagine that Mac’s guitar strings were still warm from the previous night’s performance down the road at the University of Mississippi. In Oxford, he had performed at last night’s Governor’s Concert at the Mississippi Bicentennial Celebration North. Gentleman that he is, Mac grinned politely through his beard at the heavy-handed reference to the song he crafted nearly three decades earlier. Mac’s “Back Where I Come From” charted at 14 on the country charts in 1990 but, when Kenny Chesney included a live version in his Greatest Hits album ten years later, the song’s ode to simple hometown pride found an even greater audience. With Mac soon celebrating his 60th birthday, “back where he came from” was why I was in Belmont – the unassuming hometown and childhood of the man that, as of the summer of 2017, had claimed an unprecedented eight Country Music Association’s Musician of the Year honors. And, happily for me, Mac was glad to oblige my curiosity about the one-stoplight town in northeast Mississippi’s Tishomingo County. Climbing into my own truck, Mac directed me in an easy arc through Belmont, as we drove only a short distance but, simultaneously, passed almost five decades back in time. Pulling out of Spark’s’ parking lot, we rolled past a ubiquitous Sonic Drive-In. 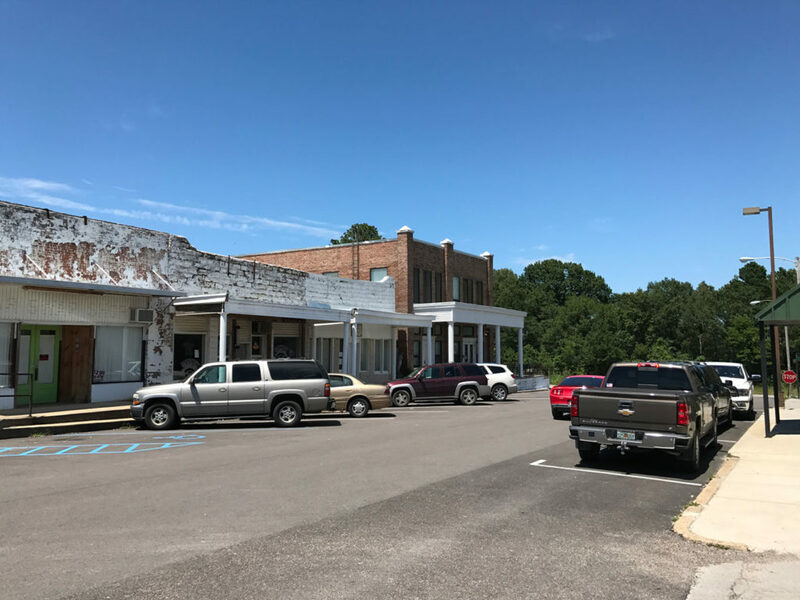 Where he comes from – downtown Belmont, Mississippi, hometown of Mac McAnally. Our first stop was Belmont’s cemetery, where Mac’s late parents were buried. “This was my first job,” Mac remembered. “Mowing the grass. With a push mower. The widows would come out and watch me from their cars. I was either not trimming it close enough or I was getting too close to the tombstones. Not an easy job with all that supervision.” He shook his head with a good-natured chuckle. From there, it was a scant quarter-mile down two-lane Main Street to the First Baptist Church. “That’s where we went to church,” Mac said as we pulled up under a shade tree across from the church. “My mom played piano for the church, and worked in the Wrangler jeans plant during the week.” Belmont was one of several communities in Mississippi in which the Blue Bell Company had mills that manufacture, among other things, Wrangler jeans. Leaving the cemetery, we soon reached a collection of low-slung buildings that made up Belmont’s collection of schools. Mac’s father, a World War II veteran, was the school’s principal – which made the next story Mac shared with me all the more surprising. By the time Mac was in high school in the early 1970s, his budding musical skills had caught the attention of a local gentleman named Shelby Dean Lindley, who fronted a band that plied the honky-tonk trade in the counties north of the Tennessee state line. Dean paid a visit to Mac’s parents, explained to him that he could make $250 a weekend playing in Shelby’s band, and that, even better, he could learn the craft of being a true performing musician. Most importantly, he solemnly assured Mrs. McAnally that he would keep her son Mac out of trouble. Mac’s father and mother – the school principal and the Baptist Church piano player – gave Mac their blessing to join the Reefers and, ultimately even allowed him to drop out of school as his music career continued to expand. For Mac, his parents’ support was essential. “I wouldn’t have dropped out without their permission. Daddy would have got all the grief,” Mac explained as we continued our loop through town. We passed Deaton Funeral Home, where a tense knot of men had gathered outside the establishment’s front door. Then came a row of single-story storefronts, some vacant, some occupied by the likes of Belmont TV and Belmont Florist & Gifts. 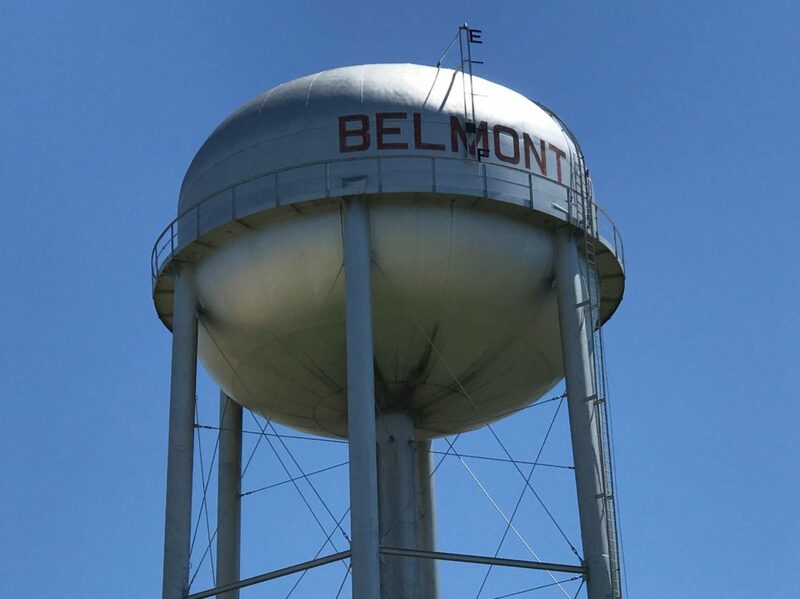 The block constituted half of downtown Belmont; the other half sat across Highway 25, with the tracks of the Mississippi Central beyond it. “That you were burning . . .” I interrupted. Mac paused for a moment as a memory caught up with him. Mac followed ‘Down Yonder’ with ‘Wildwood Flower,’ Carl kept dancing, the tips kept coming, and Mac kept playing. By the end of the impromptu concert, there was 54 dollars and change in Carl’s hat – a take that Carl split with young Mac. Belmont’s city park stood nearby; Mac directed it to me next. We pulled off alongside the grass and walked over to a maroon-colored commemorative marker, texted with gold script. I recognized it as one of the markers for the Mississippi Country Music Trail. 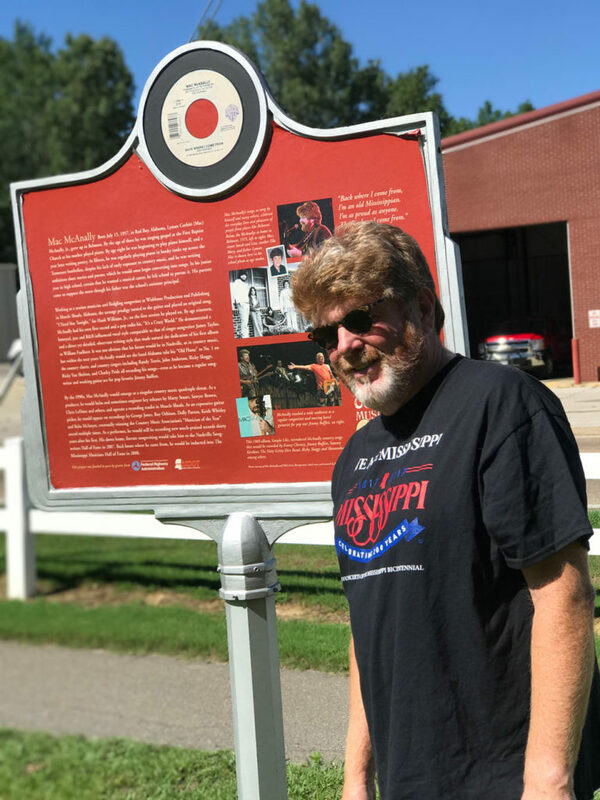 “Lyman Corbett ‘Mac’ McAnally, Jr., grew up in Belmont, where he sang and played piano at the Belmont First Baptist Church before becoming a session musician and songwriter at the age of fifteen,” the sign declared. “When it says ‘session musician,’ the sign means your time in Muscle Shoals, right?” I asked. He nodded affirmatively. “Wishbone Production and Publishing,” Mac said. I noticed that he had pulled a black plastic guitar pick out of his pocket; he fingered and rolled it absently in his hand as I read the litany of his musical achievements as recited by the sign. “You’ve engineered releases by Marty Stuart and Chris Ledoux,” I continued. “I’m working with Chris’ son Ned now,” Mac offered. He paused for a moment, and then spoke again. As we turned to leave, the guitar pick with which Mac had been fidgeting fell to the ground. I reached down to pick it up. I left Mac back at his truck; I returned to Birmingham, and he headed on to his home and studio in Sheffield, Alabama, where he was putting the finishing touches on an album he was producing for Ned Ledoux. Within two weeks he’d be on the road with Jimmy Buffett for another summer tour. Later, autumn brought Mac a ninth title as the Country Music Association’s Musician of the Year award; only a week afterwards, however, a heart attack struck him while he was in Nashville. Mac and I exchanged texts as I was finishing this article, and I asked him about his recent brush with mortality – and if that brought his hometown into any sharper focus. After an afternoon with Mac in Belmont, I think I would agree with him on both accounts. Necessity leads to one couple's new life.